We planned to hold an open house for our recently completed project, but the winter weather had other ideas. You can find more pictures in our Portfolio. 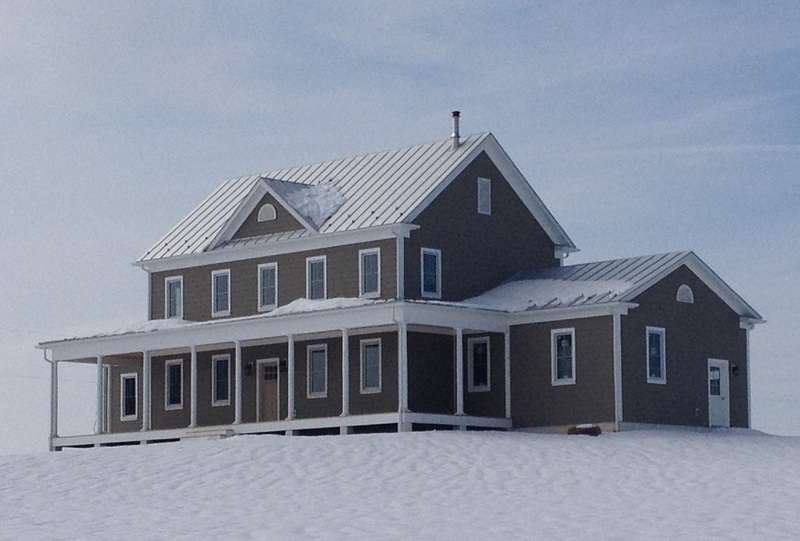 We recently completed our net-zero farmhouse project. The house has a contemporary design and feel, but the exterior pays tribute to the classic farmhouse designs found throughout the Shenandoah Valley. This project combined energy efficiency with resilient design. Genesis Home and Energy installed an islandable PV system (discussed in a previous blog). Key electrical circuits will be maintained during a power outage: lighting, wall outlets, well pump, refrigerator and freezer, microwave, etc. We mitigated these risks by making the house all-electric, and eliminating exhaust appliances. The range hood is recirculating. The dryer is a condensing, ventless model. We were also careful about specifying a woodstove with an outside air kit--and positioning the inlet and chimney to provide excellent draft. John Semmelhack of Think Little fame completed several tests to determine if the woodstove would negatively affect the house. He found that the woodstove had a negligible effect on the house pressure (within the noise of precision). This measurement held when the woodstove was cold AND when it was operating. He determined that the stove pulled between 10 - 15 CFM (cubic feet / minute) when operating. With the outside air intake the majority of that air is supplied from the exterior. 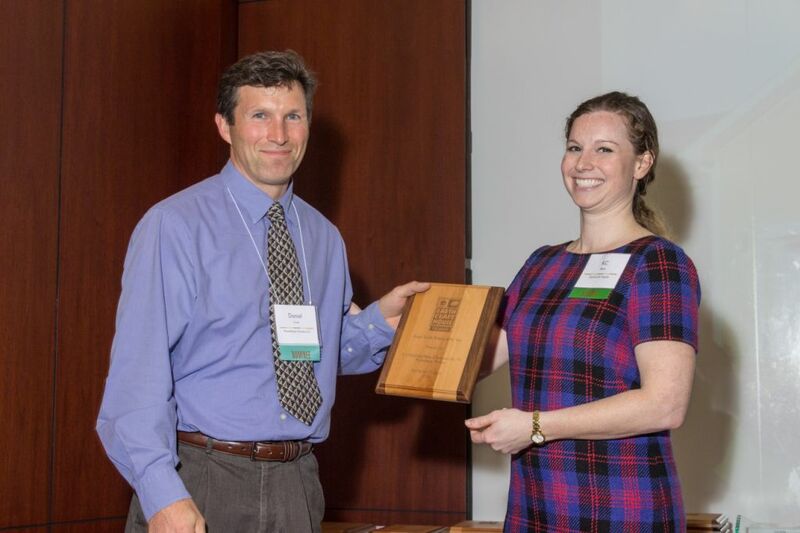 We're proud to announce that we recently won a Housing Innovation Award for our project in the Woolen Mills section of Charlottesville! Click the logo above to read the case study on the Department of Energy's website. Weatherseal Insulation installed "all-borate" cellulose in both the walls and the attic. They used three different techniques, including damp-spray, dense-pack, and loose fill! Airflow Systems, Inc. installed the HVAC system according to specifications. Note that they are the only Energy Star certified HVAC company in our area / region. They used a large quantity of mastic to reach duct leakage targets! Think Little, LLC acted as the energy consultant. This description doesn't begin to describe their work, which included energy modeling, HVAC design (Manual J and Manual D), blower door testing, HVAC commissioning, HERS rating, Earthcraft certification, Energy Star certification, and the DOE Zero Energy Ready Home application. 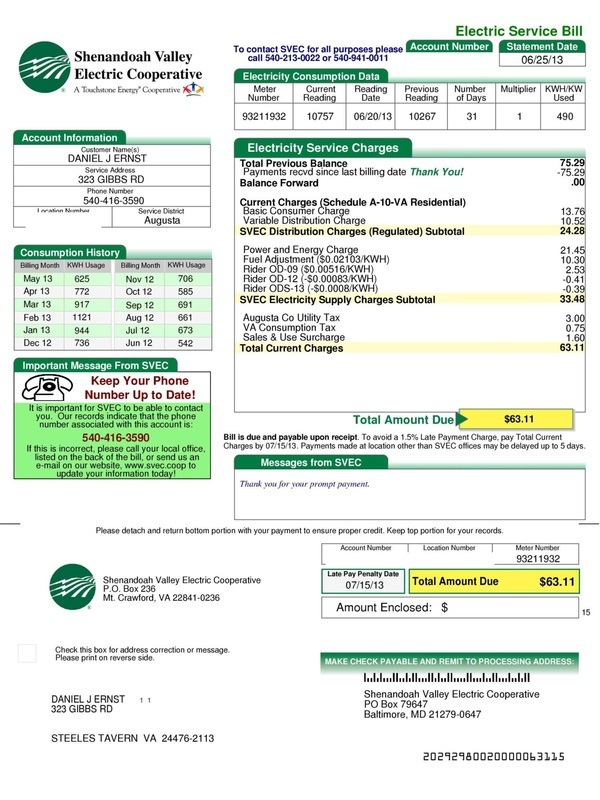 Finally, we're pleased to report the homeowners electric bills for the summer months; the average monthly bill on this all-electric house was $64.44. This simplified Sketchup drawing shows the conceptual view of our latest project, a net zero farmhouse. Genesis Home + Energy will design and install a 6kW photovoltaic system to service the house. Promethean Homes is proud to announce that we recently started construction of our first zero energy house. Like all of our projects we will build this one in a cost-conscious and energy-efficient manner. However, this house will feature two additional systems designed for resiliency: an islandable PV array and a small wood burning stove. So, let's ignore the question that's nagging you right now (is islandable even a word?) and move onto describing an islandable PV system. Simply stated, an islandable PV system provides the benefits of a grid-tied system AND an off-grid system. During normal operation the PV system will sync with the electrical grid to provide electricity to the house. When the grid is operational the PV system will feed electricity to the house AND to the electrical grid. When it produces more electricity than is consumed by the household that electricity will be fed back into the grid (to be used by neighboring houses and businesses). When it produces less electricity than is consumed by the household that deficit will be supplied from the grid. But what happens when the grid goes down? In a standard grid-tied PV array the system disconnects from the grid and shuts down. This is a safety feature that prevents electricity from backfeeding the grid (which could potentially injure those people working to repair service lines or components). It works much like a whole-house generator. The controls disconnect from the grid, but then restart to supply power to just the house. Unlike a whole-house generator this system will produce power with ZERO noise. Although the house will be equipped with two Fujitsu slim duct heat pumps, it will also feature a small cast-iron woodstove. The owner will be able to heat the house during a power outage---using a locally sourced biofuel. This woodstove will be connected to a dedicated outdoor air supply. This will prevent the woodstove from depressurizing the house; it will also ensure that the appliance does not backdraft. In addition to the resilience provided by this woodstove, let's not forget comfort and ambiance. The high-temperature radiant heat from a woodstove is nearly impossible to match. 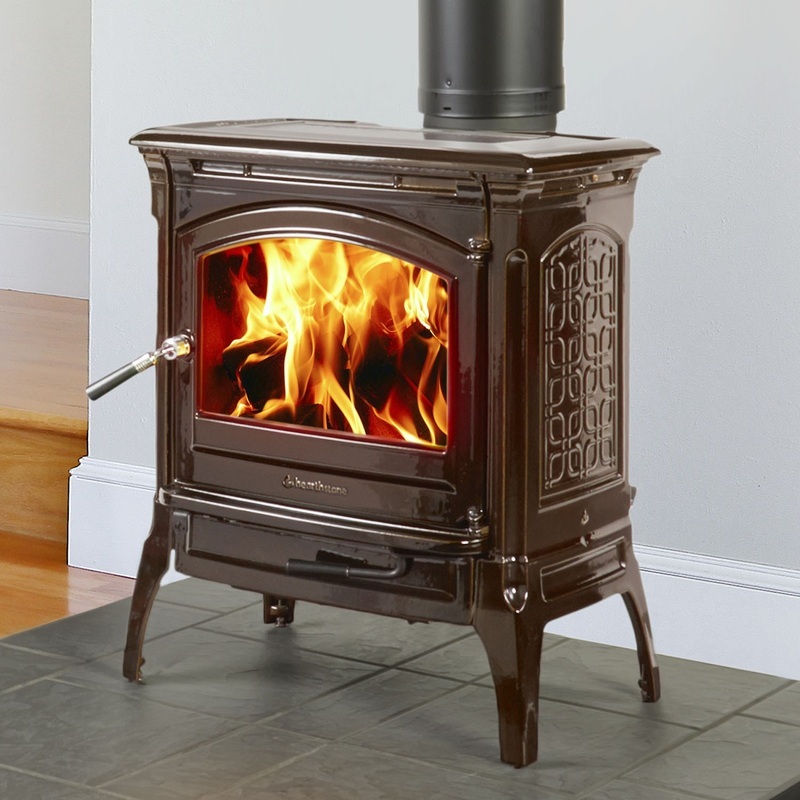 The Hearthstone Craftsbury 8391 woodstove will provide back-up heating. This small EPA compliant stove can be connected to a dedicated outside air supply duct, an important feature for energy-efficient houses. On a crisp winter morning, driving through the neighborhood, it is easy to spot thermal bridges. No, you don't need a infrared camera, or any other sophisticated equipment. Mother nature provides the visual tool. We call it condensation, or frost. With this simple tool it is easy to see where the insulators did a poor job, or where an electrician installed a recessed can light. And you certainly don't need a stud finder to see the location of the studs and rafters. In this example rigid mineral wool insulation covers the entire stud wall; this exterior insulation creates a thermal break (slowing down conductive heat transfer). Simply put, heat is lazy. It follows the easy path. And it always moves in the same direction---from hot to cold, or more accurately, from a higher state of energy to a lower state. Heat has three modes of travel: they are radiation, convection, and conduction. No, we're not talking about nuclear energy. Think of fire or sunlight. Even though the air temperature near a fire might be cold, you will still feel very warm when you sit directly in front of that fire. This phenomenon is known as radiant heat flow. In buildings, we don't really worry about this to much, but we do consider it when we think about windows and roofs (i.e. unshaded west facing window). Think air. Think movement. Think of a leaky window on a cold and windy day. Can you hear it whistling? A lot of heat will move out of your house in this way, hitchhiking a ride on the air that is flowing outside. For most houses, this is one of the dominant forms of heat transfer (loss or gain, depending on the season). Convective heat transfer is why air barriers are so important. This one is fairly easy to understand. It occurs when heat flows through a material. Metals are great conductors, so heat flows through them very easily. That's why we use them for cooking, right? In houses, conduction is another important form of heat transfer. When we talk about houses and conduction, we start looking for something called a thermal bridge. Remember, heat is lazy. It follows the easy way out. A thermal bridge is that easy path. It is a solid and direct connection between the interior and exterior of the building. In Virginia, most houses are built with 2x4 stud walls. * These studs span from the inside, where they are attached to drywall, to the outside, where they are attached to the sheathing. And although we don't think of wood as a great conductor, on hot or cold days, these 2x4 studs become an interstate highway for heat flow. 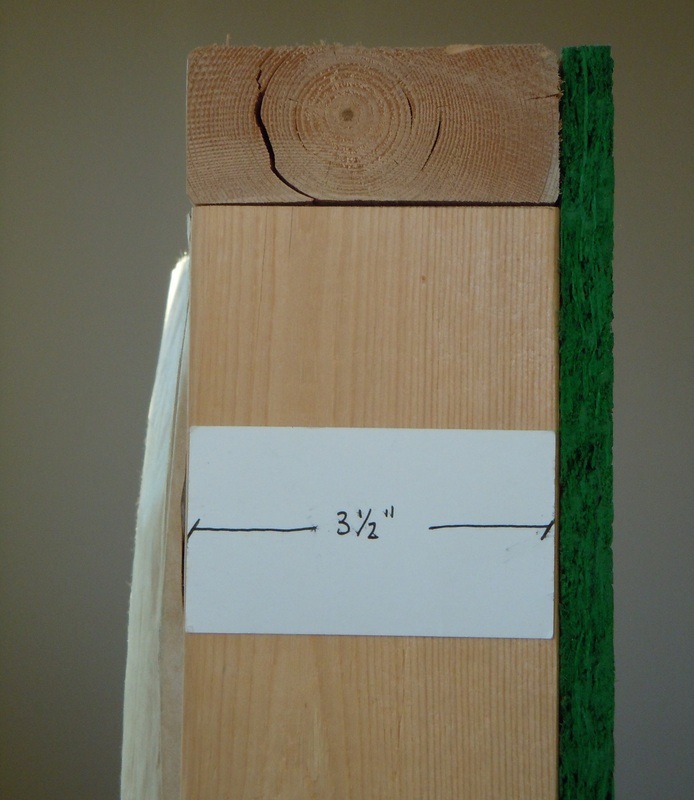 A typical stud wall is built using 2x4 lumber. These studs are only as thick as a business card is wide (3 1/2"). Although structurally adequate for most residential projects, their thermal performance is quite poor. There are a couple of ways to get around this problem. 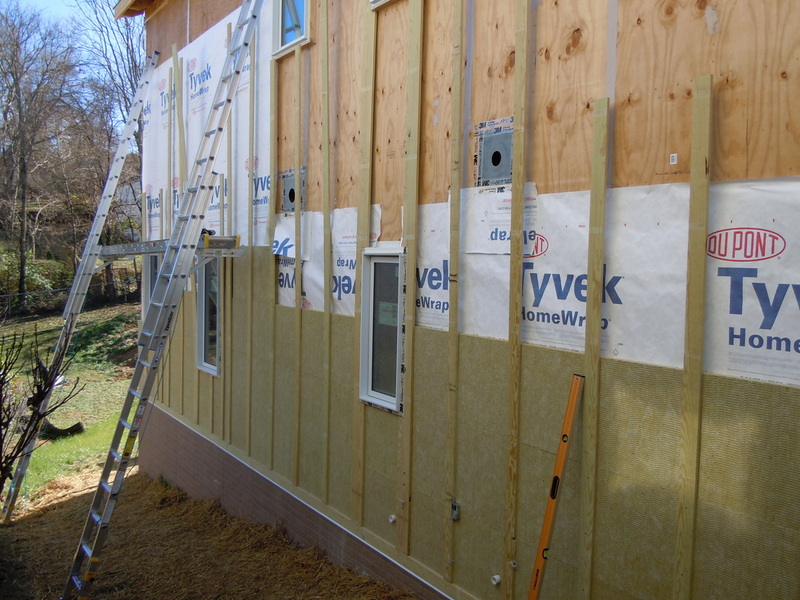 One, builders can install a layer of rigid board insulation on the outside of the structure. Common materials include EPS and polyisocyanurate foam insulation. Mineral wool is gaining a following though, due to its resistance to attack by insects, as well as its permeability to moisture. This is becoming more and more common with progressive builders. In fact, it is a requirement of the 2012 IRC code for Climate Zones 6 -8. Or two, a builder can create a double-stud wall (one is structural, the other is non-structural). The studs in this kind of wall do not span from the inside to the outside; there is a gap between them that is later filled with insulation. Either method creates a thermal break---instead of a thermal bridge---and makes it that much harder for heat to flow. As a homeowner, you get greater comfort and lower energy bills. lumber met the minimum structural requirements for two-story residences. Throw in some machine drawn nails, and you have the birth of modern-day framing systems. We have since transitioned from balloon framing to platform framing, but stud sizes have remained fairly consistent for > 125 years. 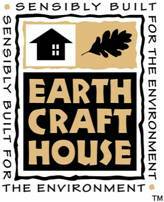 Promethean Homes, LLC is now a Builder Member of EarthCraft Virginia! Visit their website to learn more information about their green building programs. The Modern Smokehouse . . .
Should we call these Outdoor Wood-fired Boilers or Outdoor Wood Smokers? These units deliver less heat and more smoke than any other wood stove technology. 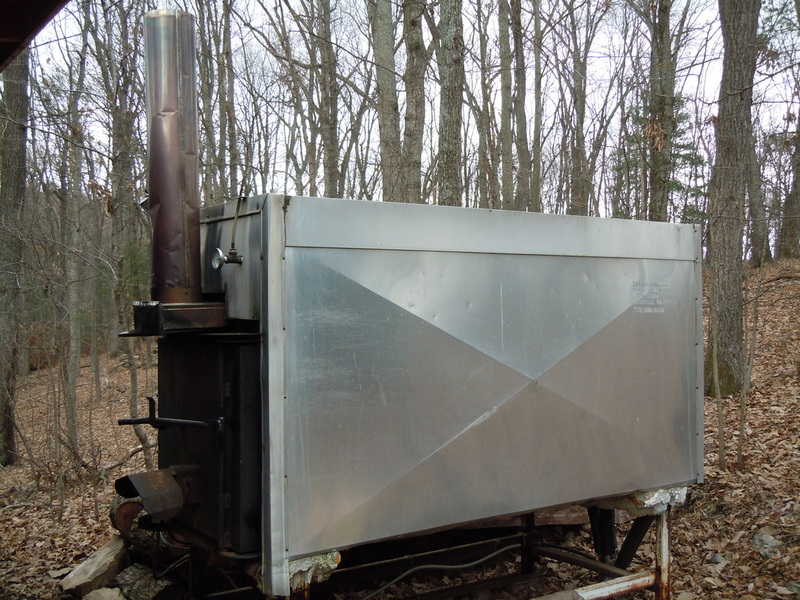 In the rural areas of Augusta County, out in the beautiful countryside, you don't have to drive far to find an OWB (Outdoor Wood-fired Boiler). If you don't see one, then perhaps your nose will lead you in the right direction. Or just look for a hovering cloud of smoke . . .
1) Woodlot owners want to use a cheap and readily accessible form of energy. 3) High temperature supply (some people call this "warm heat"). 4) Limited involvement. The firebox is large enough that owners only have to load wood once or twice a day. Let's step back for a moment now, and really analyze the sensibility of purchasing or using an OWB. An OWB has the following features: a large combustion chamber, a water manifold / tank, an electric fan or damper, and a short smoke stack. The OWB is coupled to the house through a number of water distribution pipes. A small water pump transfers the heated water from the OWB to the house. Inside the house, the water distribution pipes may be coupled with a hot water heater, a hydronic radiant heating system, or a heat exchange coil inside of an air handling unit. According to one of just a few independent studies, the typical OWB is between 30% - 40% efficient---just half that of an indoor wood stove. Even more disconcerting, these tests do not evaluate the amount of electricity that is consumed by the OWB. These units require electric power to operate the outdoor fan unit, the hot water pump, and oftentimes, the blower on a forced air heating system. Although the electricity required to run the outdoor fan and water pump is small, a blower can consume a large amount of electricity. So when we add the parasitic losses of the fan, the water pump, and the blower to the calculation, the efficiency of these units becomes even more dismal. The current building code disallows wood burning appliances as primary heating systems. So the cost of an OWB is in addition to a more modern appliance---say a heat pump or propane furnace. The cost to purchase/install an OWB and the associated plumbing can range between $8,000 - $12,000 (an Augusta County resident recently told me they had received a quote of $10,000 to replace their existing OWB). Again, let me restate: this is in addition to the cost of a building's primary heating system! If we compare the cost of an OWB to an indoor wood stove, it is 2X - 3X more costly, even if we include the expense of a new Class A stainless steel chimney for the indoor unit. According to a study commissioned by the state of New York, OWBs produce between 4X - 12X as much particulate matter (smoke) as indoor wood stoves. When compared to a modern gas furnace, OWBs produce 1,800X more particulate matter. No wonder many localities have banned OWBs. To make matters worse, the smoke emitted by an OWB is near the ground level (due to the short stack height of the chimney). That means the smoke from an OWB is more likely to end up in your house, in your lungs, or wafting across your neighbor's property. So, let's review: an OWB will cost TWICE as much as an indoor woodstove, operate at HALF of the efficiency, and produce 4X - 12X more particulate matter. If this evidence weren't damning enough, consider this: an indoor wood stove operates passively (stack effect carries the combustion gases up through the chimney). OWBs need electricity. Which one would you rather have during a winter storm induced power outage? Armory Lovins, a physicist and the founder of the Rocky Mountain Institute, was the first to really define the cheapest watt. He coined the word negawatt---which is kind of the opposite of a megawatt. Actually, it is the exact same amount of energy as a megawatt, it is just that a negawatt is theoretical. It represents energy that has NOT been consumed, or energy that has been saved. The negawatt is what energy efficiency and conservation is all about. The idea becomes very important when we start to talk about energy production. To illustrate the idea, I’ll use photovoltaic power as an example. Let’s say that you are interested in PV panels, and you are thinking about installing a PV array at your home or business. The first step is to evaluate the cost of saving energy VERSUS the cost of producing that same amount of energy. Star® rated), a DVD player, audio amplifier, and maybe even an old VHS player. Each and every one of these devices is drawing power, even when they are turned OFF (they are designed like that for a variety of reasons). In geek speak, this is known as a phantom load. 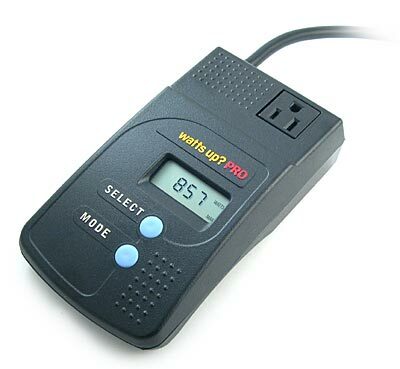 Using a watt meter, we find that together, these devices are drawing (18) continuous watts. It is energy that is being consumed, but not really put to any good use. How much energy does the entertainment center consume per day? This system uses 432 watt hours / day. Over the course of a full year, it will consume almost 158 kilowatt hours. At the going rate of electricity, that will only cost about $16 per year. No big deal, right? Of course, no system is 100% efficient. Most PV systems are “derated” by 15% -20%. Let’s avoid getting too detailed here. We’ll just call it a 100 watts. PV systems are currently being installed for $3 - $5 / watt. That means we’ll need to spend $300 - $500 in order to generate the same amount of electricity that is being consumed by the entertainment center. That energy is not so cheap anymore . . .
What is the cost of saving that same amount of energy? Well, if the entertainment center is plugged into a switched outlet, it wouldn’t cost anything; you would simply have to turn OFF the system at the wall switch, just like you turn OFF a light. If it’s not on a switched outlet, you could install a power strip and turn it OFF there. Power strips are pretty cheap, usually < $10 each. Most people would find that too cumbersome; they would probably want to install a “smart” power strip like this one. It automatically turns OFF these devices when you power down the TV, eliminating most of that phantom load. These sell for ~ $30. So . . . you can see that the negawatt is the cheapest solution. In this example, it ranges in cost from $0 - $30, compared to $16 for the annual cost of electricity, or the $300 - $500 cost of producing the same amount of energy using a renewable energy (PV) system. How many negawatts have you produced lately? !